The most popular hiking destination in Yoho National Park is Lake O’Hara (see Lake O’Hara Hiking), but visiting this very special place requires advance planning. We also recommend the following Yoho trails. 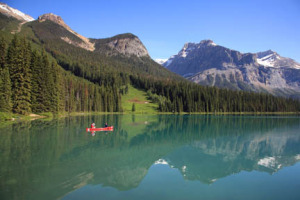 One of the easiest yet most enjoyable walks in Yoho is around the park’s most famous lake. The trail encircles the lake and can be hiked in either direction. The best views are from the western shoreline, where a massive avalanche has cleared away the forest of Engelmann spruce. Across the lake from this point, Mount Burgess can be seen rising an impressive 2,599 meters (8,530 feet). Traveling in a clockwise direction, beyond the avalanche slope, the trail to Emerald Basin veers off to the left, and at the 2.2-kilometer (1.4-mile) mark, a small bridge is crossed. Views from this point extend back across the lodge to the Ottertail Range. Beyond the lake’s inlet, the vegetation changes dramatically. A lush forest of towering western red cedar creates a canopy, protecting moss-covered fallen trees, thimbleberry, and bunchberry extending to the water’s edge. 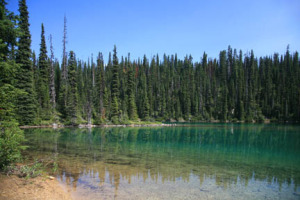 Just over one kilometer (0.6 mile) from the bridge, the trail divides: The left fork leads back to the parking lot via a small forest-encircled pond, or continue straight ahead through the grounds of Emerald Lake Lodge. Park staff lead a guided hike around the lake every Saturday morning, departing at 10 a.m. from the parking lot trailhead. The trail to these falls begins from the Emerald Lake parking lot, down the hill from the bridge to the lodge. It’s an easy walk through a forest of Engelmann spruce and subalpine fir to a viewpoint at the base of the falls. A little farther along, the trail begins switchbacking steeply and offers even better views of the cascade. The trail continues beyond the waterfall to Hamilton Lake, which lies in a small glacial cirque a steep 880 vertical meters (2,890 feet) above Emerald Lake. 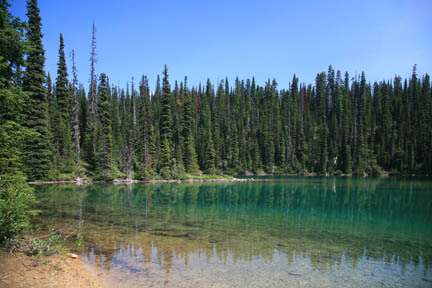 Total distance from Emerald Lake to Hamilton Lake is 5.5 kilometers/3.4 miles (2.5 hours) one-way. The trail to the delightful Emerald Basin begins from the west shore of Emerald Lake, from where it’s a steady three-kilometer (1.9-mile) climb through a subalpine forest to the basin, which, chances are, you’ll have to yourself. The most impressive sight awaiting you there is the south wall of the President Range, towering 800 vertical meters (2,625 feet) above. The valley for which the park is named lies north of the TransCanada Highway. As well as the sights discussed previously, it provides many fine opportunities for serious day hikers to get off the beaten track. The following day hikes begin from different trailheads near the end of the road up Yoho Valley. In each case, leave your vehicle in the Takakkaw Falls parking lot. This trail takes over where the road through the Yoho Valley ends, continuing in a northerly direction up the Yoho River to Twin Falls, passing many other waterfalls along the way. At spectacular Twin Falls, water from the Wapta Icefield divides in two before plunging off an 80-meter-high (262-foot-high) cliff. Mother Nature may work in amazing ways, but sometimes she needs a helping hand–or so the CPR thought. In the 1920s, the company dynamited one of the channels to make the falls more symmetrical. Twin Falls Chalet was built below the falls by the CPR in 1923 and today offers hikers light snacks through the middle of the day. The Iceline is one of the most spectacular day hikes in the Canadian Rockies. The length given is from HI—Yoho to the highest point along the trail (2,250 meters/7,380 feet). (Day hikers are asked to leave their vehicles across the road from the hostel, in the Takakkaw Falls parking lot.) From the hostel, the trail begins a steep and steady one-kilometer (0.6-mile) climb to a point where two options present themselves: The Iceline Trail is to the right, and Yoho Lake is to the left. After another 20 minutes of walking, the Iceline Trail option enters its highlight–a four-kilometer (2.5-mile) traverse of a moraine below Emerald Glacier. Views across the valley improve as the trail climbs to its crest and passes a string of small lakes filled with glacial meltwater. Many day hikers return from this point, although officially the trail continues into Little Yoho River Valley. 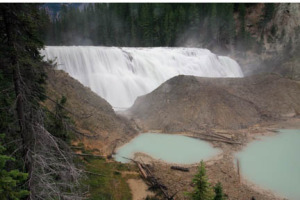 Another option is to continue beyond Celeste Lake and loop back to Takakkaw Falls and the original trailhead, a total distance of 18 kilometers (11.2 miles). The trail to Yoho Lake, which can be combined with the Iceline Trail, officially begins along the hostel access road, but hikers are asked to leave their vehicles across the road in the Takakkaw Falls parking lot. 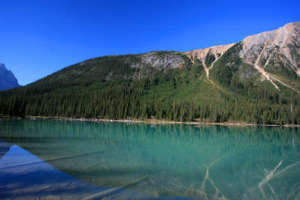 It leads 3.7 kilometers (2.3 miles) to picturesque, spruce-encircled Yoho Lake, where you find picnic tables and campsites. Options from this point include continuing to Yoho Pass (below the tree line), from where it’s 5.5 kilometers (3.4 miles) and an elevation loss of 530 meters (1,740 feet) down to Emerald Lake; six kilometers (3.7 miles) and an elevation gain of 300 meters (985 feet) to spectacular Burgess Pass; or 2.4 kilometers (1.5 miles) north, with moderately steady elevation, to an intersection with the Iceline Trail. The hikes detailed as follows are along the TransCanada Highway. 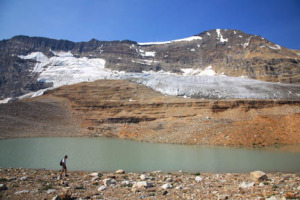 The hike to Sherbrooke Lake, which is fed by the Waputik Icefield, is easier than trails to most other subalpine lakes as the trailhead is close to where the Trans-Canada Highway crosses the Continental Divide, meaning less elevation gain is needed. Most of the elevation is gained in the first half of the hike, after which the trail levels out and before you know it, you’ll arrive at the rocky lakeshore. A rough trail continues beyond the lake to Niles Meadows (allow another hour each way), although a more popular option is the trail to Paget Lookout, which is moderately strenuous but worthwhile for the panorama of the Kicking Horse River Valley. This options is signposted near the halfway mark of the trail to Sherbrooke Lake. The first section traverses a forest of Engelmann spruce. Then the trail breaks out above the tree line just below the lookout, the site of an abandoned fire tower, 3.5 kilometres (2.2 miles) from the highway trailhead and with an elevation gain of 520 metres (1,700 feet). Hoodoos are found in varying forms throughout the Canadian Rockies, but this outcrop, officially known as the Leanchoil Hoodoos, is among the most impressive. 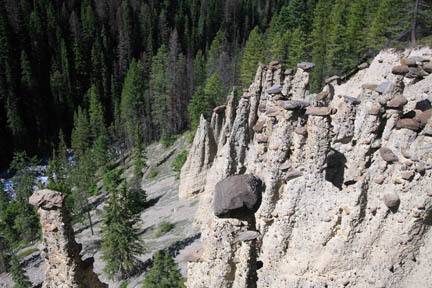 Hoodoos are formed by the erosion of relatively soft rock from beneath a cap of harder, more weather-resistant rock. Although these examples require some effort to reach, their intriguing appearance makes the trip worthwhile. The first half of the trail, through a decommissioned campground, is relatively flat, leaving all the elevation gain to be made in the last, painful 1.5 kilometers (0.9 mile). In the park’s extreme southwestern corner, this trail follows an old fire road for one kilometre (0.6 miles), then narrows for an easy stroll through thick forest to a viewpoint above these 30-meter-high (100-feet-high) falls on the Kicking Horse River. A steep, switchbacking descent leads 500 meters (0.3 mile) to a viewpoint downstream of the base of the falls.